The Ark-La-Tex region (a portmanteau of Arkansas, Louisiana, and Texas; also stylized as Arklatex, ArkLaTex, or more inclusively Arklatexoma) is a U.S. socio-economic region where the 4 Southern states of Arkansas, Louisiana, Texas, and Oklahoma abut. The region contains portions of Northwest Louisiana, Northeast Texas, South Arkansas, and the Little Dixie area of Oklahoma. 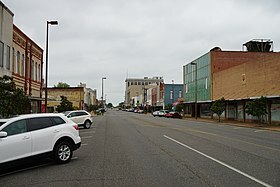 The largest city and center of the region is Shreveport, Louisiana. Other major cities in the Ark-La-Tex include Tyler, Texas, Longview, Texas, Marshall, Texas, and Texarkana. ^ Bonnye E. Stuart, Louisiana Curiosities: Quirky Characters, Roadside Oddities & Other Offbeat Stuff ( Globe Pequot, 2012), ISBN 978-0762769773, pp. 5-7. Excerpts available at Google Books. ^ See generally Kip Lornell and Tracey E. W. Laird, eds., Shreveport Sounds in Black and White ( University Press of Mississippi, 2008), ISBN 978-1934110423, and in particular the introductory section entitled "The 'Ark-La-Tex' and Music Research" at pp. xii-xvii. Excerpts available at Google Books; other excerpts also available at Amazon.com here. ^ Tracey E. W. Laird, Louisiana Hayride : Radio and Roots Music along the Red River: Radio and Roots Music along the Red River ( Oxford University Press, 2004), ISBN 978-0195347180, p. 6. Excerpts available at Google Books. ^ "Webb Pierce" in Michael Erlewine, ed., All Music Guide to Country: The Experts' Guide to the Best Recordings in Country Music ( Hal Leonard Corporation, 1997), ISBN 978-0879304751, p. 364. Excerpts available at Google Books. ^ "KWKH Maps Big Build-Up on Hillbillies", Billboard, August 30, 1952, p. 19.